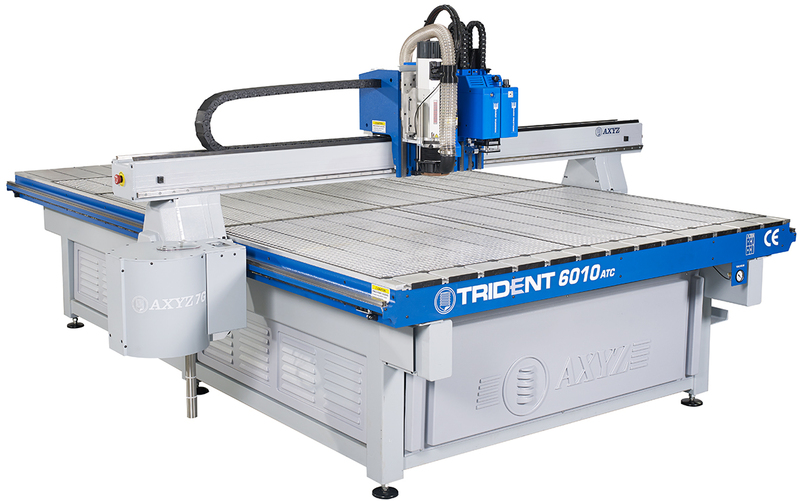 Widths from 60" to 85"
Trident is the most versatile CNC router-knife hybrid in the industry. 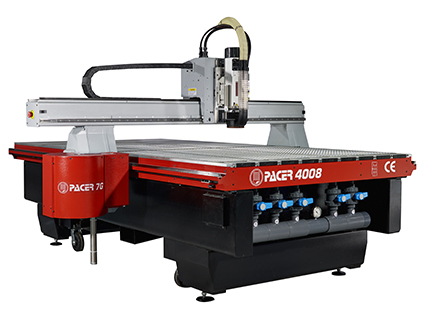 This innovative CNC cutting solution combines three different cutting technologies, including a choice of routing spindle and two knives, which can be either tangential, oscillating, or a combination of both. With the most configurable machine base in the industry, Trident provides maximum flexibility with process widths from 60" to 85" or greater and the option of virtually any length required. Operating at up to 2,000ipm and driven by the latest drive system, the Trident support spindles up to 10HP and processing heavy-duty materials like acrylic, aluminum and medium-density fibreboard (MDF) up to 4in. (102mm) thick. While, its knife tools can be used for lightweight material such as vinyl, foam board, coroplast, styrene and rubber. 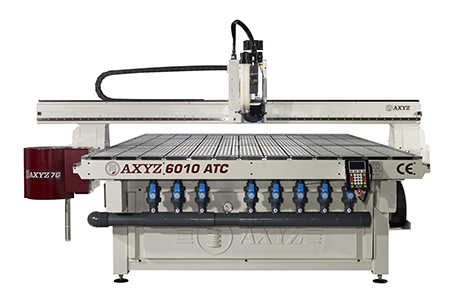 The Trident features manual, quick-release, high-power and high-speed (up to 40,000 rpm) router spindle options, a camera recognition system for precise cutting path alignment and accuracy, aluminum zoned vacuum beds and an automatic tool length sensor and changer. Progressive innovation allows companies to differentiate themselves and gain a competitive advantage in their market. Without it, businesses can quickly become lost to conformity and complacency. This applies just as much to the sign industry as to any other business segment. Duff Graphics in Concord, Ont., has been serving the graphics sector of the sign industry since 1968. As such, it has needed to evolve to keep up with many technological developments over the years. At its recent International Sign Expo in Orlando, Fla., the International Sign Association (ISA) presented the 2016 Innovation Awards, honouring six products judged ‘best of the best’ by an independent panel of sign and graphics industry experts. Comsign is a small shop in Edmonton with roots dating back to the 1940s and which has passed through many owners’ hands over the years. Originally known as Commercial Signs, its name was shortened in 2001 after a change in direction to focus on the architectural signage market. While the rule of thumb among professional installers is to always apply vinyl graphics ‘dry,’ there are some exceptions where the correct way to apply vinyl to a flat plastic surface is ‘wet’ instead, using a commercial-grade application fluid.